Born Brooklyn, NY, July 4, 1899. Killed Brooklyn, NY, Nov. 4, 1959. A link between the older Frank Yale organization of Brooklyn and the Giuseppe Profaci Crime Family, Frank Abbatemarco was one of several members of the Abbatemarco-Magnasco clan to be gunned down in mob hits. As a teenager, Frank Abbatemarco found work in a local lumber yard. Within a couple of years, he was a employed as a teamster for a firm on Manhattan's lower west side. But legitimate work was not for him. About 1921, Abbatemarco married. He and his wife Mary settled into a home on President Street in the Park Slope neighborhood of Brooklyn, just east of Gowanus. In the spring of 1922, their son Anthony was born. In October of 1922, Abbatemarco was sentenced to two years in Atlanta Federal Prison following a conviction for conspiracy to sell morphine. Abbatemarco confessed that he alone was guilty of the charge in an apparent effort to win the release of a number of codefendants. One defendant, Michael Esposito, was discharged. However, Giovanni Bombara, Vincenzo Raiola, John Panico and Gaetano Sorentino were also convicted. Following the assassination of Brooklyn gang leader Frank Yale on July 1, 1928, Yale-affiliated gangsters appear to have been divided between regional crime families. Those from South Brooklyn, including the Abbatemarcos, seem to have been assigned to the Profaci Crime Family. It was not a smooth transition. Michael "Mike Schatz" Abbatemarco, reportedly the head of a beer monopoly, was murdered that October after leaving an all-night poker game with some of the Cardellos. Frank Abbatemarco, on the other hand, became an important member of Profaci's organization and ran a lucrative lottery in South Brooklyn. The authorities seem to have been aware of Abbatemarco's criminal activities in the early 1930s. He was arrested in New York City on Aug. 27, 1931, for vagrancy and discharged two weeks later. The following year, he was taken in by Jersey City, New Jersey, police on suspicion, and later released. New York Police arrested him again in May of 1934, releasing him a few days later. At some point, Abbatemarco acquired his late brother's nickname and was known as "Frankie Schatz" or "Frankie Shots." As his importance in the underworld increased, so did his independence. By the early 1950s, he was a Mafia capodecina leading an independent-minded crew of policy racketeers and burglars based in the Gowanus and Park Slope areas of South Brooklyn. The members of his crew would later figure prominently in a civil war within the Profaci organization. 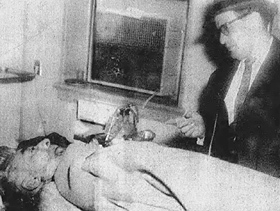 The 53-year-old Abbatemarco and a number of his men were arrested by the Special Rackets Squad of the Brooklyn District Attorney's Office on March 25, 1952. Frank Abbatemarco and his son Anthony, 30, were accused of leading a policy racket believed to rake in $2.5 million a year. Initially held as material witnesses in the case were Lawrence Gallo, 24; his brother Joseph Gallo, 23; Carmine Persico, 18; and several other men. Lawrence Gallo was found to be in possession of 20 new suits recently stolen from a warehouse in Manhattan. In mid-April, Frank and Anthony Abbatemarco, Lawrence Gallo, Carmine Persico, Frank Iliano, Charles Brown, Walter Hare, Charles Wilson and Willie Huff were charged with conspiracy to operate a lottery. All initially pleaded not guilty. On June 24, Frank and Anthony Abbatemarco pleaded guilty to lottery charges. Frank was sentenced to a year in Riker's Island Penitentiary. Anthony was sentenced to nine months in the facility. In the later 1950s, the independence of the South Brooklyn crew became a problem for crime boss Joe Profaci. The Abbatemarcos, the Gallos and Persico, feeling entitled to retain the bulk of the policy racket proceeds, began withholding required tribute payments to Profaci. Brooklyn Daily Eagle, Nov. 6, 1959. On Nov. 4, 1959, Frank Abbatemarco became the second member of his family to be murdered after socializing with the Cardellos. At 7:55 p.m., he was leaving a tavern owned by Anthony Cardello when he was confronted by two men wearing topcoats, fedoras pulled down low and scarves across their faces. Abbatemarco was shot at the door of the tavern and turned and ran back inside. The gunmen pursued. As Abbatemarco shouted, "No, no," they fired repeatedly into his body. They then turned casually and walked out the door. Rumors indicated that the Gallos themselves had been persuaded by Profaci to set up or possibly even to perform the murder of their old friend and underworld chief Abbatemarco. The Gallos reportedly believed their reward would be control over the old Abbatemarco lottery. Profaci made a bad situation worse when he snubbed the Gallos and presented that racket to his own relatives. Frank Abbatemarco's son Anthony, rumored also to be a Profaci target, went into hiding. He later became a puzzling character in the Gallo civil war against Profaci, but survived to lead a powerful faction within the Profaci-Colombo Crime Family. Bonanno, Bill, and Gary B. Abromovitz, The Last Testament of Bill Bonanno: The Final Secrets of a Life in the Mafia, New York: Harper, 2011 (Kindle version), p. 196. Frank Abbatemarco Identification Record, Record no. 461 379, Federal Bureau of Investigation, published within Carr, Charlie, New York Police Files on the Mafia, Hosehead Productions, 2012, p. 644. Cook, Fred, MAFIA! Greenwich, CT: Fawcett Gold Medal, 1973, p. 205-207. Cressey, Donald R., Theft of the Nation, New York: Harper Colophon, 1969, p. 201. Raab, Selwyn, Five Families: The Rise, Decline and Resurgence of America’s Most Powerful Mafia Empires, New York: Thomas Dunne Books, 2006, p. 322-323. New York State Census of 1915. Passenger manifest of S.S. Cheribon, sailed from Naples, arrived New York City March 9, 1887. United States Census of 1910. United States Census of 1920. “Drug sellers jailed pending an appeal,” Brooklyn Standard Union, Oct. 31, 1922. “Uale’s successor slain in auto by lone gunman, jealousy in gang hinted,” Brooklyn Daily Eagle, Oct. 6, 1928, p. 1. “Ex-convict seized in policy ring raid,” New York Times, March 26, 1952. “Raids smash $2,500,000 policy ring,” Brooklyn Daily Eagle, March 26, 1952, p. 1. “Racket jurors to get more policy ring info,” Brooklyn Daily Eagle, March 27, 1952, p. 3. “9 deny lottery charges,” New York Times, April 16, 1952. “Two gunmen kill gambling figure,” New York Times, Nov. 5, 1959. “Mafia strikes boro again! Police hunt killers here,” Brooklyn Daily, Nov. 6, 1959, p. 3. Buckley, Thomas, “Ex-detective chief says gang war dooms Gallos,” New York Times, Aug. 15, 1963. Gage, Nicholas, “Colombo family underboss flees after failure to overthrow chief,” New York Times, June 5, 1977. Krajicek, David J., “Frankie Abbatemarco is the opening casualty in the Profaci family civil war,” New York Daily News, Sept. 19, 2010.